From the team behind “Frozen”, “Tangled”, and “Wreck-it Ralph”, comes Big Hero 6 the latest animated action-packed comedy-adventure from Walt Disney Animation Studios. Raised by their aunt Cass, Hiro and his older brother Tadashi are just two average boys with a knack for robotics. But just as Tadashi introduces Hiro to his plus-sized robot Baymax and teaches him how to harness his genius, tragedy strikes. As the city of San Fransokyo falls under the threat of Yokai, Hiro Hamada learns it will take more than his own powers to save the city and uncover the mystery of the man behind the mask. But when Hiro realizes things may not be as they seem, Hiro sets out to right the wrongs bestowed upon his family and quickly learns this is not a fight he can fight alone. With the help of his close friends adrenaline junkie Go Go Tomago, neatnik Wasabi, chemistry whiz Honey Lemon, fanboy Fred, and of course his inflatable plus-sized robot Baymax, this group of prodigies transform into a band of high-tech heroes determined to save the city. Big Hero 6 opens with a fierce robotic fight scene and an action-packed chase as we watch Hiro make a run for his life, but just as Hiro is about to meet his demise, his brother Tadashi swoops in and rescues him from what is sure to be a devastating end. With all the heart and humor audiences expect from Walt Disney Animation Studios, the unwavering brotherly love between Hiro and Tadashi only strengthens as the story continues, emphasizing the importance of brotherhood and family. But just as Hiro learns to trust the guidance of his older brother tragedy strikes, and Hiro has to once again deal with the heartbreaking loss of someone he loves. In a first for Walt Disney Animation Studios, we watch the tear-jerking moments Hiro goes through as he struggles to cope with the emotional stages of death, grief, and understanding loss. Blinded by sadness and full of vengeance, Hiro fails to see how much he is truly loved by those still with him. As he struggles with his grief, Hiro finds comfort in his new-found friend Baymax, who sparks his brother's spirit within him and gives Hiro a reason to fight and live. Still filled with the anger and desire to amend his brother's death, Hiro learns that revenge is not the answer. After a series of events in an attempt to save the city, Hiro learns not all things are as they seem, and sometimes heroes can be villains too. Based on the famous city by the bay, San Fransokyo is a fantasy world mash-up of San Fransisco and Tokyo. 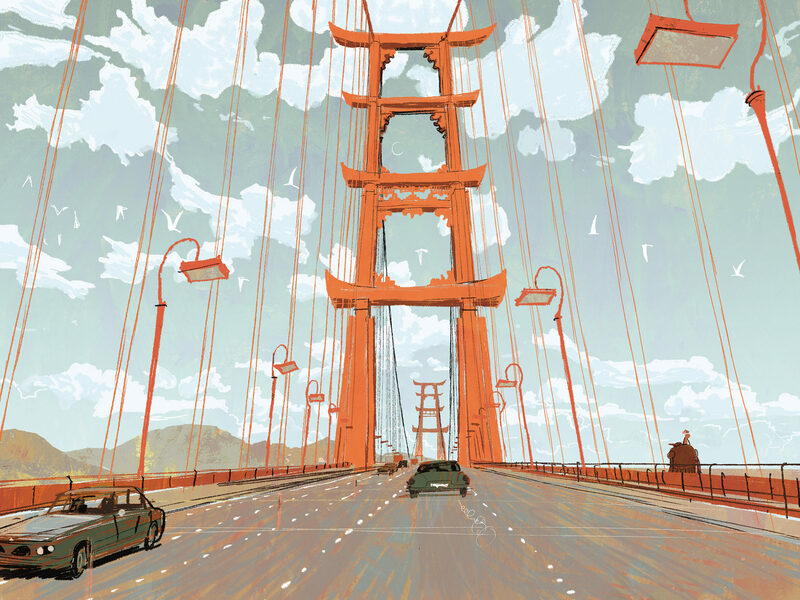 From the stunning Golden Gate Bridge to the historic cable cars, famous Broadway Street, beautiful Treasure Island, and even the spectacular kite festival on Chrissy Island, San Fransokyo opens the hearts of viewers and invites them to fall in love with this beautiful, animated city. Big Hero 6 is directed by Chris Williams and Don Hall, produced by Roy Conli, and features the talent of Ryan Potter (voice of “Hiro Hamada”), Scott Adsit (voice of “Baymax”), Damon Wayans Jr. (voice of “Wasabi”), T.J. Miller (voice of “Fred”), Genesis Rodriguez (voice of “Honey Lemon”), Jamie Chung (voice of “Go Go Tomago”). Big Hero 6 opens in theaters everywhere Nov. 7th, 2014. For more information, check out www.Disney.com/BigHero6, like them on Facebook, and follow us on Twitter. All images have been provided courtesy of Walt Disney Studios.